"I have the strength you give me"
The Argentine peso was hit hard this past week on the black market: the official rate hovers slightly above 5 to the US dollar, but on Wednesday the “parallel” market saw it move up 48 centavos (cents) to trade at $8.75. That’s 75% over the official rate. The peso made a comeback later in the week to drop into the $8.45 range. Black market dealers in the “caves” on the pedestrian malls on Florida Street and near Plaza de Mayo reported that the streets were suddenly flooded with dollars, a possible attempt by the government to cause some pain to speculators. By comparison, on Wednesday Buenos Aires was crawling with hawkers yelling “Cambio! Cambio!” – it seemed everyone, young and old, male and female, wanted to get in on the game. Local press also reported arrests at the Bolivian border of people trying to move large sums of $US into the country. The black market for the “blue” – an Argentine colloquialism for the US dollar – is being further driven by increasing government restrictions on dollar purchases. 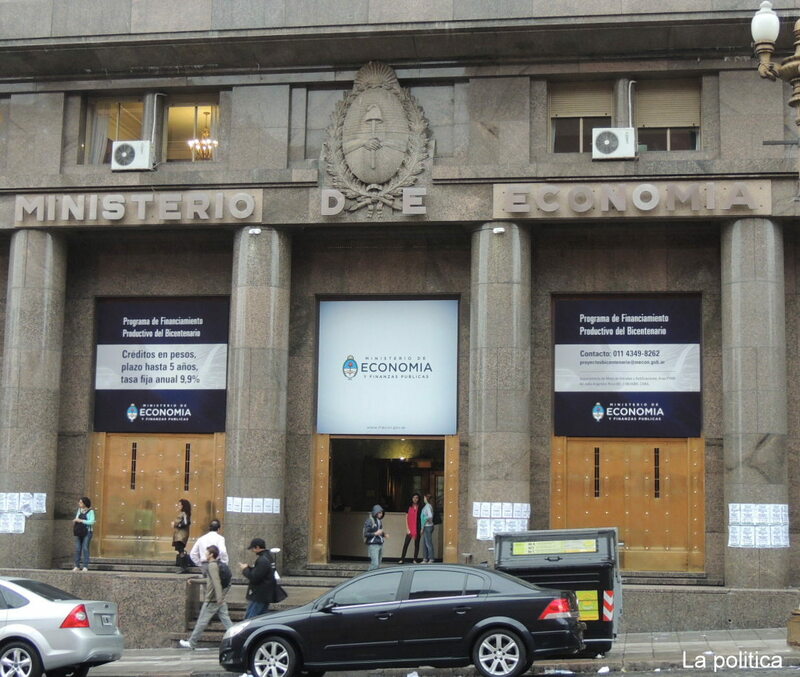 Officially, inflation is now at 26%, but in the past two weeks La politica has observed it moving at about 1% a week, suggesting the country may be heading for an annualized rate closer to 50%. 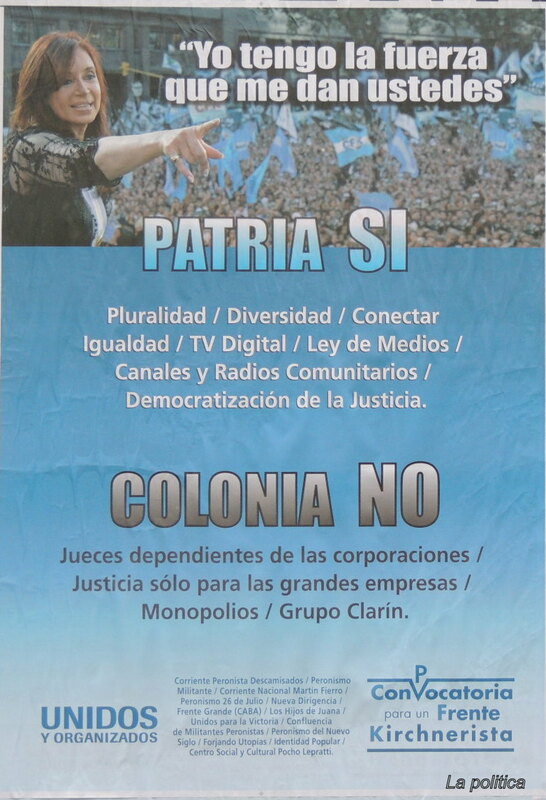 Trade unions in Argentina – from teachers, to machinists, to construction workers – are angling for raises from 25% to 30%. 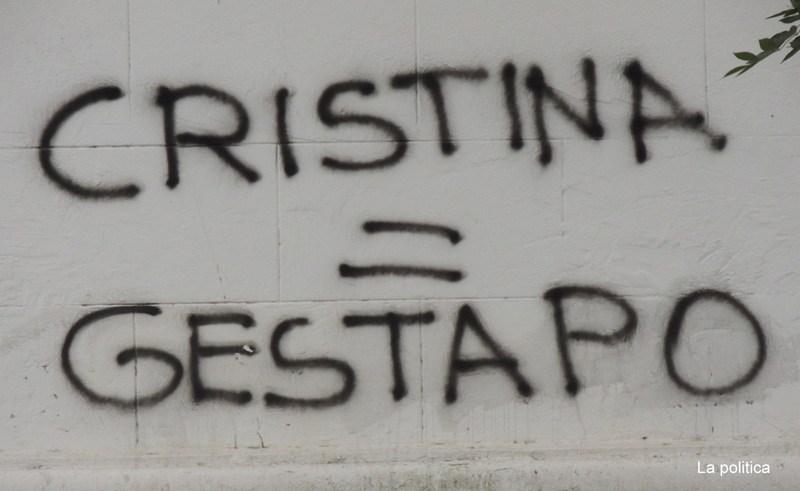 The left-leaning government of President Cristina Kirchner is trying to keep those raises in the low 20s; however, Kirchner risks losing political support from her base should she enter into open conflict with unions. To control inflation the government has tried everything from price controls, limits on credit card usage at supermarkets, and establishing direct co-operatives for the sale of food staples. The assumption is that the profit-incentive within a free market system is both inflationary and unjust, and that by somehow removing this phenomenon prices will magically stabilize. However, though opportunistic profit taking is inflationary and at times out-right criminal, that is not the root of the problem, which is a grossly inefficient economy in which large segments of the population are being bought off with an increasingly worthless currency. Taxes are on the rise, with the government trying one rear-guard action another, including a 20% levy on offshore credit-card purchases. The problem was that people were buying foreign goods at the cheaper official rate. This practice has already led to a US $7 billion drop in reserves. Imported goods are becoming increasingly pricy, and foreigners who are forced to exchange money at the official rate via bank machines and through credit transactions are finding that Argentina is becoming a more expensive country. (Not that we have much sympathy, given the carpet-baggers that arrived from United States after the crisis in 1999-2002, buying up property cheap from hurting locals). And Argentines themselves are voting against their own currency by buying dollars whenever and wherever they can as a hedge against a looming devaluation. Foreign currency reserves have shrunk by $2.2 billion in the past year. In January of this year analysts tracked by Consensus Estimates anticipated that the peso would trade at just over 6 to the dollar in 2014 – essentially factoring in inflation at 20%, which was then double the official government figure. But the black market is now painting a direr picture. With foreign reserves at just over US $40 billion, the Argentine government has room to maneuver. It would rather respond by shoring up its base at home that throwing away dollars to speculators, but it will have to put up some kind of fight to stabilize things, which will inevitably result in a drain on reserves. Otherwise, if inflation takes off the situation could spiral completely out of control. As it stands, the government is already showing signs of losing its grip, and the bond market has taken notice, with insurance costs skyrocketing. As a result, a devaluation seems inevitable – the only question is when, and by how much. Argentina is alone in this fight: other Latin American economies have the reverse problem, with strengthening currencies and strong inflows of investment. Some breathing space might come from rising commodity prices: Argentina's soybean crop is almost in, and soy exports are a backbone of the economy. As well, foreign investors are still buying high-yield US dollar denominated Argentine bonds. And there is certainly no panic in the streets. Argentines, after all, have seen it all before, and in Buenos Aires the hustle and bustle of daily life continues as usual, with no sign of social unrest.